People are being butchered in Iraq. People are being butchered in Syria. A young black man was killed in Ferguson, Missouri. These stories of human carnage dominate the news cycle. The reports on cable news outlets are non-stop. Did you hear about the carnage here in Iowa? You didn’t? Perhaps you should. Roughly 50,000 Iowans have died violent or chemically-induced deaths in the past decade. That’s a chunk of humanity in a state with a stagnant birth rate. What an outlandish claim. Right? The quote above comes from none other than the Priest for Life himself, Fr. Frank Pavone. Fr. 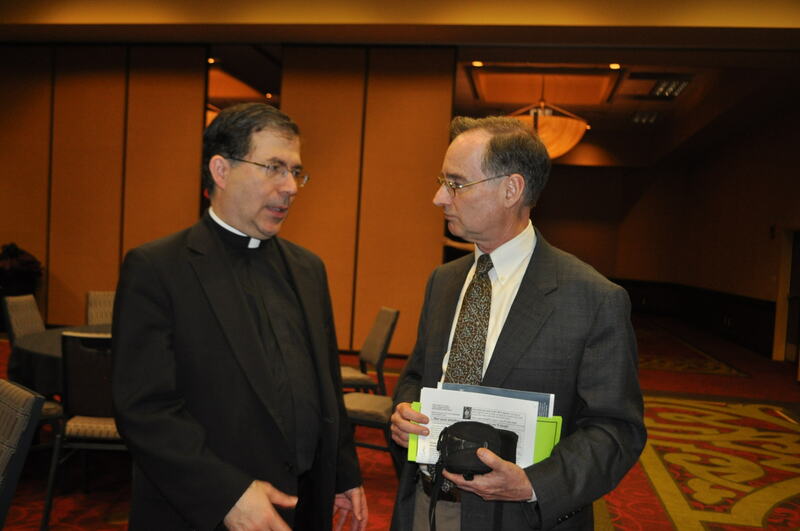 Pavone was in Des Moines last Saturday night as the keynote speaker at Iowa Right to Life’s annual banquet. He explained that the typical pro-choicers don’t know the truth about abortion. They don’t know, he explained, that abortion is legal throughout all nine months of pregnancy. He turned and pointed at a huge banner hanging behind him. It showed a 5 month old fetus. They don’t know that that obviously human-looking fetus has not a single civil right. They don’t know, he explained, that the preborn feel pain at about 20 weeks, and that their deaths are agonizing. They don’t know that human abortion dismembers the preborn. They don’t know, he explained, that babies are being killed immediately AFTER they are born alive, or survived a botched abortion. He said they don’t know that Dr. Kermit Gosnell isn’t the only baby killer operating in America’s abortion mills. Too many people who are pro choice are ignorant of the truth about human abortion, and become less receptive to abortion rights the more they learn. That’s why America is slowly, but surely, becoming increasingly pro life. More and more former pro-choicers are having their eyes opened to the cruelty, to the inhumanity, of human abortion, and they’re changing their minds. Even more, Fr. Pavone pointed out how the Roe v Wade generation is a pro life generation. Think about it. They could have been aborted if their moms had thought their pregnancy was inconvenient. What a chilling, and unjust thought. Fr. Pavone encouraged us to keep educating and building bridges with our pro choice friends and family. Granted, some, many, are intractable. But many more can have their minds changed as they learn more about the emotional, spiritual, and physical toll human abortion takes on women … and even those who work in the abortion mills. Fr. Pavone gives healing retreats to former abortion mill employees. One worker after another agonizes over the image they’re left with in their minds, which includes the physical blood of their victims on their hands. The blood from their tiny victims was even splattered on their gowns. These workers agonize over what they did. They are repentant, they seek forgiveness, they seek healing. Fr. Pavone tells them the only cure for them is more blood, the blood of Christ. They are washed clean by His healing, purifying blood. Let us continue our outreach to pro choicers with solid information that will properly inform their consciences. January 22, 2014-DES MOINES, IOWA-Iowa Right to Life has discovered that Planned Parenthood of the Heartland has quietly laid off all but one employee (a center manager) at their Creston and Red Oak, Iowa locations. In addition, Iowa’s largest abortion provider has halted surgical abortions at its Bettendorf and Sioux City abortion centers.